“Cannot take it, cannot take it”. Proceeds to dive into bag to find scarf, jacket, glove — anything to save you from the 30seconds of cold from the airport door to the taxi. It’s okay, don’t malu. We’ve all been there. For all our fellow suakus, here’s a cold wear guide to help you prepare for holidays in cooler climates. Good for you btw! Leaping out of our sweaty tropical island and venturing out into the realm of icy wind and snowflake kisses… lots of fun, new experiences to be had! But you have to be prepared to be comfortable. 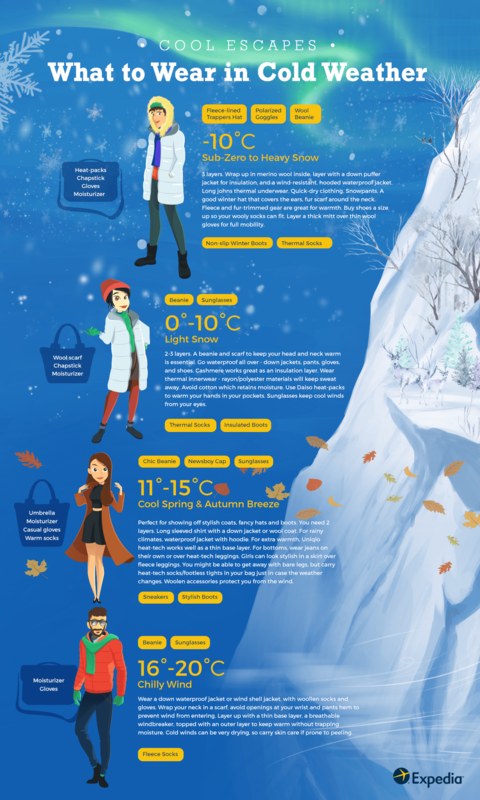 Our cold weather infographic below gives you an idea how to dress for winter, cold wear for different temperatures and conditions including autumn and spring and how to layer. A holiday in such climates also tends to bring dry skin, chapped lips, cold rain, or strong winds. Look in each bag for a few winter-survival essentials to keep on you at all times. Before you go, shop for the right type of jackets, shoes, hats and don’t forget your bag of tricks. Always keep your head, hands and feet warm.